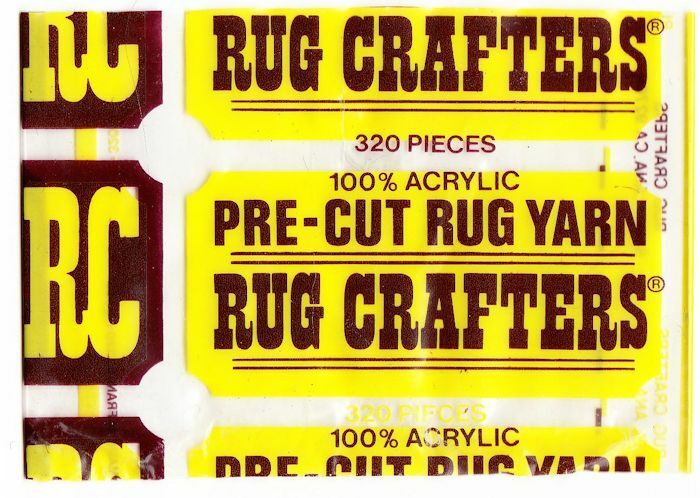 Up until the end of the 1970s, there were several companies producing or distributing rug yarn under their own names. There have been buy-outs, takeovers and dissolutions, but their yarns are often found on online auctions. This illustrated guide is by no means comprehensive! 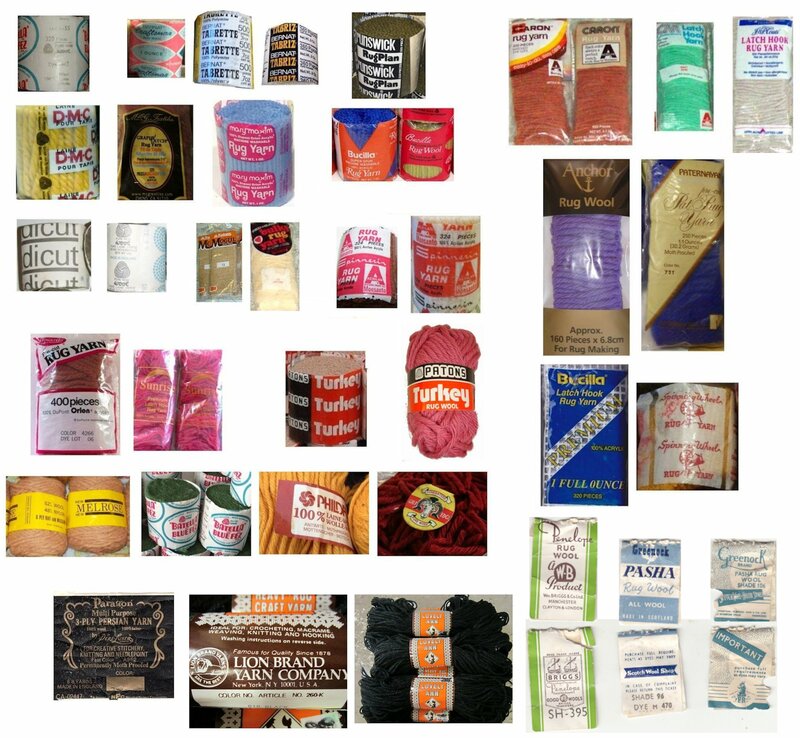 I’ve tried to group brands under their current or last parent companies, giving the type of fibre where possible. Atlascraft Turkey - Atlascraft took over Patons' Turkey brand. Skinny Fez - wool/acrylic mix. Fez yarns discontinued and Bairns Wear, who produced them, became part of Courtaulds. The Bernat name is licensed to Spinrite LP, but no longer produces rug yarns. Brunswick "Rug Plan" - 100% Irish wool. Brunswick closed in the 1990s. Bucilla have concentrated their needlecrafts on embroidery and cross-stitch. Columbia-Minerva became part of Caron International. The Caron-Wonderart brand is licensed to Spinrite LP. 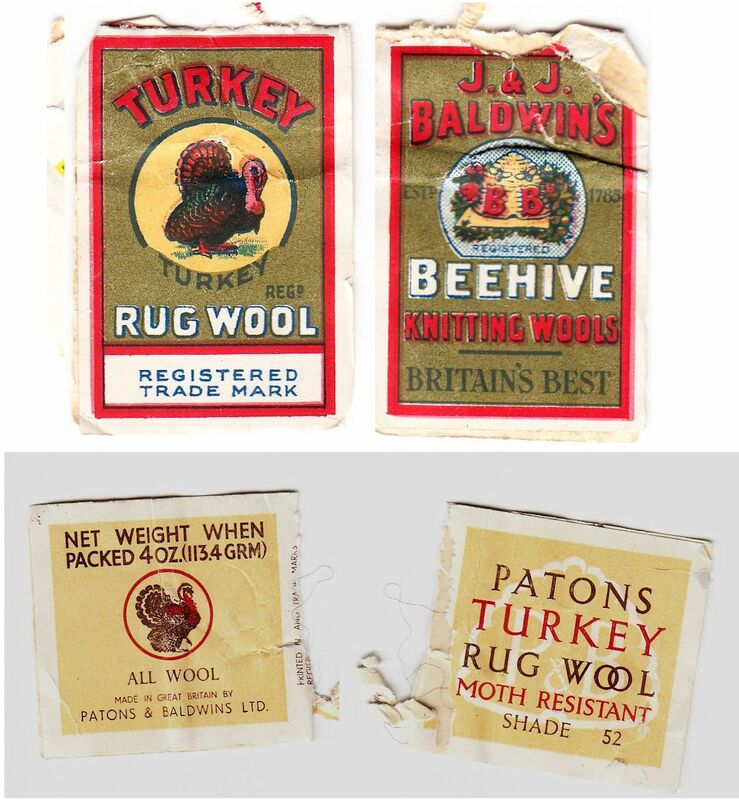 Coats re-branded their rug yarn as Anchor and discontinued the Patons Turkey brand after acquiring Patons & Baldwin. Cronit Melrose - wool/acrylic mix craft mool for rugs and macrame. Paternayan - now owned by Saco River Dyehouse who are reintroducing the Paternayan lines of needlecraft and rug yarns. Readicut & Shillcraft - depending on era, either 100% wool or a blend of wool and acrylic. The original Readicut was ultimately broken up and sold off. Shillcraft were the North American distributors of Readicraft products. Spinnerin Yarn Company was active between the 1950s to the 1970s, and was located in Hackensack, New Jersey, USA. The company ceased trading in 1982. Sunrise Rug Yarn - 100% acrylic. Made in China.